M-F | 8:30 a.m. to 5:30 p.m.
Huston-Tillotson University is committed to providing quality health care for its student body that is accessible, timely, and customer service oriented with dignity. Maintaining good health is essential and a top priority for an optimal educational experience. 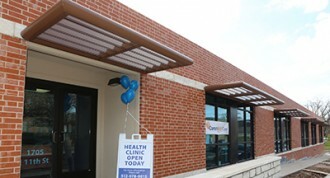 The Sandra Joy Anderson Community Health and Wellness Center has partnered with CommUnity Care to provide internal medicine, women’s health, mental health, as well as nutritional counseling. The Center is located on campus at 1705 East 11th Street. 512.978.8400. Hours of operation are Monday – Friday 8:00am – 5:00pm. St. David’s Medical Center serves as our primary care facility for after hours and/or emergency medical care. Immunizations are required in accordance with Texas Department of Health Immunization Schedule as informed by the Advisory Committee on Immunization Practices’ (ACIP) recommendations as adopted by the Texas Board of Health. All students must comply with institutional immunization requirements in order to reside on-campus and attend classes. Students shall show acceptable evidence of vaccination prior to entry, attendance, or transfer to a private institution of higher education. *THE MENINGITIS VACCINE IS REQUIRED AND MUST BE ADMINISTERED AT LEAST 10 DAYS BEFORE MOVING INTO THE RESIDENCE HALLS OR 10 DAYS BEFORE CLASSES BEGIN. Failure to comply will result in canceled registration. Texas law allows for an exemption from immunizations for reasons of conscience. There are different processes for submitting an exemption depending on the type of institution. Please visit https://corequest.dshs.texas.gov for information on how to obtain an official exemption. The Affordable Care Act is a federal law designed to increase the number of people who have access to health insurance. If you do not have health care insurance, the Eligibility Team at CommUnity Care is available to explain and determine programs and benefits that will meet your eligibility criteria. Please call 512.978.9015 to schedule an appointment with a CommUnity Care Eligibility Specialist. All student-athletes are required to provide proof of medical insurance. Any student-athlete carrying alternative insurance, such as that for a dependent on a parent’s policy or an insurance policy purchased by themselves for themselves, should check to ensure that it covers injuries or conditions caused by participating in athletics. The HT Athletics Department does not carry insurance for athletes, so the student-athlete is responsible for all expenses (co-pays, deductibles, fees, payments, etc) resulting from any services performed by any physician or office, even if it is required by HT to acquire clearance to play. To attend school in the U.S., International students must have an insurance policy that meets certain requirements. Students should contact the International Student Advisor at 512.505.6472 for specific information. For more information regarding student insurance, immunizations and healthcare provided through the Community Health and Wellness Center, please contact The Office of Student Affairs at 512.505.3036 or email studentaffairs@htu.edu.